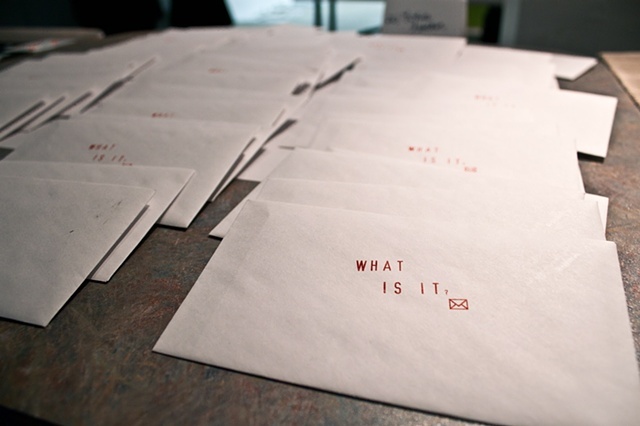 Installation view of packaged hand-stamped cards in hand-stamped envelopes, pre-distribution for the Artist Trading Card event, Gallery Connexion, Fredericton. How do you properly say, “This isn’t art” in French? In searching for the proper translation, I’ve discovered that there may be different ways to say this, depending on whether art is an object or a process. I do not pretend that I’ve gotten it right. This artist trading card, this object, represents a process of participation in events, giving and receiving, in both Chicago and Fredericton. These cards were created in my MFA studio in Chicago for Open Studio Night at the School of the Art Institute of Chicago. I visited different studios and distributed the cards to other artists, as possible accusations or challenges. I also handed them out to visitors to my studio, as possible denials. In the process, I was in a state of art. I then mailed the cards to myself at an address in Fredericton, for distribution at the artist trading card event at Gallery Connexion.